On August 14 Vaughn, Ashley, Cami, and I went to Maeser's Back to School Night. While Ashley and Cami socialized and I waited in the long lines to pay fees and get schedules, Vaughn wandered around the school. He came across a stack of papers that contained profiles of students from around the world who wanted to be foreign exchange students but still needed host families. A cute girl from China, Xiaoyi, really grabbed his attention. He brought me her profile and told me, "I really think we should do this!" It didn't seem very feasible. Sure it would be fun BUT...We have 7 children already! I am expecting in January! and we aren't exactly made of money! How could we host a foreign exchange student!?! We called the phone number of the Nacel Open Door Representaive anyways "just to see" what it all entailed and ... it sounded like a lot of work... forms to fill out, a home visit, a background check.... Vaughn and I AVOID extra work so we decided not to bother, "We had enough on our plate already and besides, on Nacel's website it didn't even look like Xiaoyi still needed a host family and if we were going to do this we had our hearts set on her!" The Rep didn't give up like we had. She somehow managed to get us excited enough to at least fill out the forms. Then she invited herself on over to do the home visit. I had to beg for a day to clean! She wanted to come in an hour! We must have passed the background check because on August 26, Vaughn received an e-mail from Xiaoyi thanking us for being her host family! We picked Xiaoyi up at the airport on Thursday, August 28 (only 2 weeks after first looking at her profile)! 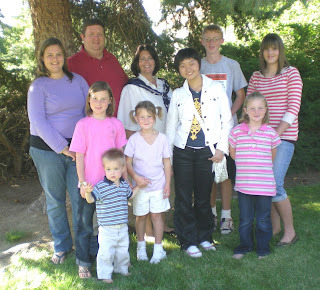 And I must say it has been a WONDERFUL EXPERIENCE to have Xiaoyi as part of our family! I stongly feel Heavenly Father has had a hand in this arrangement. I am very grateful to Him for making it all work out so well. As much as I have enjoyed blogging, for right now due to "morning" sickness that lasts all day I don't feel up to blogging or anything else. Hopefully I will be able to resume living in a few more weeks. Yes, if you haven't already heard, this is an announcement! I am expecting my last baby the first part of January!!! 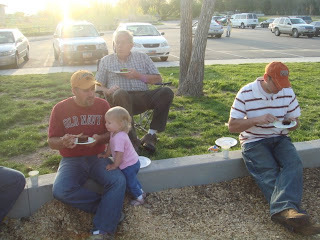 We had the Spendlove family over for dinner Sunday evening. We celebrated Katarina's, Rebekah's, Enoch's, Derek's, and Josh's birthdays! It was fun to see everyone again! We missed Larry,Venise, and Will. Some of us are spending a lot of time at the ball park. It's been fun to watch Cami play. On Monday the Indians won their game against the Blue Jays 13 to 12! On Wednesday it seemed they were going to win again against the Gators. They were ahead the whole game until the last inning and then nothing went right for the Indians. The final score was 10 to 17. Oh, well we can't win them all. 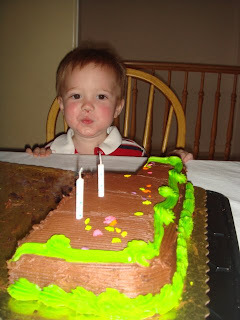 Sweet little Enoch turned 2 on May 11, Mother's Day! What a blessing he has been to our family! We are so grateful Heavenly Father sent him to us! Enoch blowing out the candles on his cake! We had quite the weekend! Vaughn lined his sister, Debbie, up with Steve, a friend from work. So on Friday night Vaughn and I went on a double date with them to The Gateway. We ate dinner at Biaggi's Italian Restaurant, and watched Ironman. It was an enjoyable evening for me, except I slept through some of the movie! 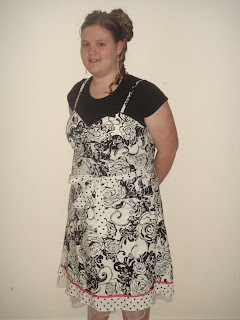 That night Ashley went to a school dance with her friends. When she got dropped off at home she found the door locked. She borrowed a cell phone and called the house and she and her friends pounded on the door but nothing woke Josh, Rachel, Rebekah, or Enoch. (Cami and Noelle were tending Preston and Katarina at Debbie's house.) So she got to have a sleepover! When Vaughn and I got home we found a note from her on the door and heard her message on the phone: "Hello, wake up! Come let me in!...." On Saturday morning, Vaughn went to work. I went to pick up Ashley. And Noelle fell into our deep window well head first! Miraculously she wasn't seriously hurt. 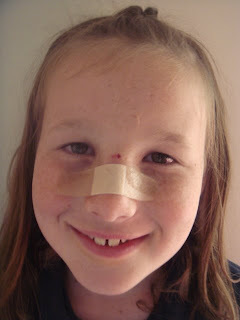 She got a bloody nose, and a small cut on the bridge of her nose. Cami and her friend Meeghan were the ones who handled the crisis. When Ashley and I got home they had her all cleaned up and feeling better. Now Noelle's nose is slightly swollen and a light purple in color. Shaylee, Aubrey, and Chance came to play on Saturday! Everyone was excited except for Chance. He wanted his mom! Our awesome new neighbors invited us to come over Saturday afternoon for a barbeque. 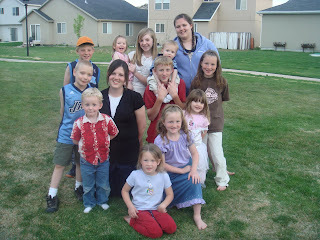 They didn't even care that we had 4 extra kids (Meeghan, Shaylee, Aubrey, and Chance) . They still wanted us to come! We had a great time getting to know them a little better and the food was great! 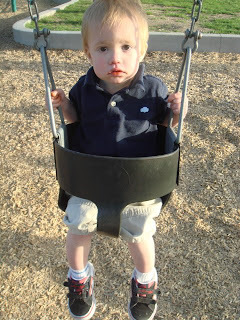 Saturday evening we went to the park with the Kearl family. Everyone came except Uncle Rich. Grandma Kearl prepared a picnic dinner. Thanks Mom! 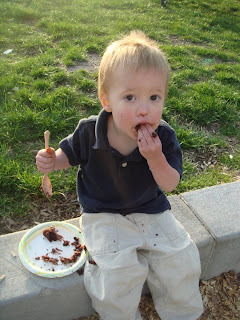 We celebrated Mother's Day and Enoch's and Aubrey's birthday. Josh did 25 push-ups! I can't even do one. I think I will take on the challenge and learn from Josh's example to do 25 push-ups! 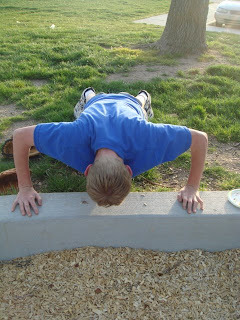 Here's my goal: 25 push-ups by August 1, 2008! Noelle being pretty even with a sore nose! Marci and Amy cleaning up! Mother's Day was great! 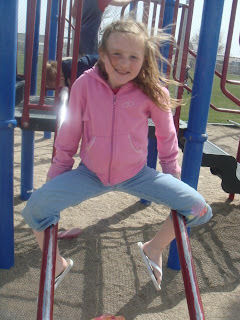 The High Priests and the Elders ran Primary so I got to go to Sunday School and to Young Womens with Ashley and Cami. 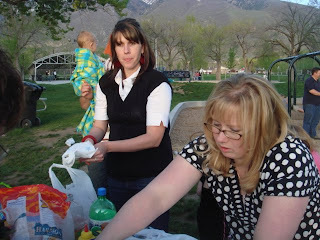 The YW leaders prepared a special lesson and light lunch for the girls and their moms. Thanks to all the High Priests, Elders, and YW leaders!! It was a real treat! After church Vaughn and the children showered me with cards and gifts and I got to relax the rest of the afternoon and evening. I Have Been Blessed With a Wonderful Mother! She taught me to pray. She took me to church even when it was as struggle with 3 small children. She taught me the gospel. She read to me and instilled in me a love of reading and learning. She always prepared well balanced meals. She let me sit on the counter when I was little and "help" her make cookies even though now I realize it would have been so much easier to do it without me. She wrote me little notes thanking me for my help and left them for me to find. She took me shopping and sacrificed her own wants so I could have mine. She was, oh, so patient! How did you do it, Mom? She taught me to drive even though that scared her. She wrote me faithfully on my mission. She has tended, played endless games, and done arts and crafts with my children. She has always set a good example and magnified her callings. She continues to be patient and hardworking. She doesn't speak ill of others. She is thoughtful and generous, always giving, always serving. She even gives gifts to her daughters for Mother's Day! She truly is my wonderful mom! She is a wonderful grandma! Thank you, Mom! I love you! Happy Mother's Day! I Have Also Been Blessed With A Wonderful Mother-in-law! She raised a great son! She taught him the gospel. She welcomed me into her family and loved me as daughter. She is generous, always giving. 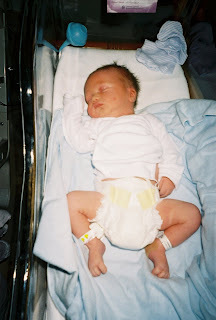 She spent her birthday in 1998, in Nevada, away from the comforts of her own tending 3 little children while I was in the hospital delivering Noelle. 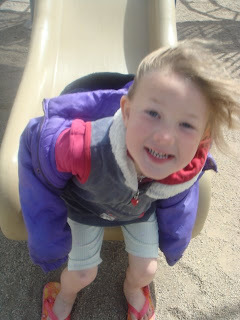 She went back to Nevada in 2000 to help me out again when I had Rachel. She is always so optimistic. She is a hard worker! She (along with Larry) has taken each grandchild old enough on a special trip. Oh, how our children have looked forward to, enjoyed, and remembered with fondness this special vacation! She loves the Lord and shares her testimony of the gospel and love for Him frequently. 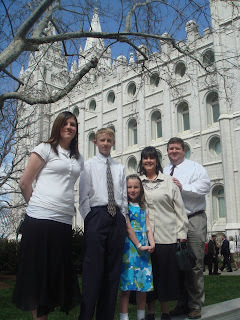 She is setting a great example for her family by serving as a missionary. She is a wonderful mother! She is a wonderful grandmother! Thank you Venise! I love you! Happy Mother's Day! A cute picture of Ashley and her friends, Stephanie (far left), Angela, and Stephanie (far right), posing after getting ready for Prom at Angela's house. Today is one of my best friend's birthday! Happy Birthday, Marilyn! The crazy thing is we met online of all places nearly 10 years ago! I was living in Nevada. She lived (and still lives) in Alabama. Although we both came from very different backgrounds, Marilyn, a Baptist in the Bible-belt and me, a Utah Mormon, we found common ground in our love for Jesus Christ and the ups and downs of motherhood. I got the chance to visit her and her family in the summer of 2000! It was one of the greatest weeks of my life! We've maintained our friendship ever since through letters, phone calls, and e-mails. This summer the plan is that she will come visit me and my family!! Marilyn, We can hardly wait! Yeah! The Indians won tonight! 18 to 1 against the Red Sox! Way to go Indians! 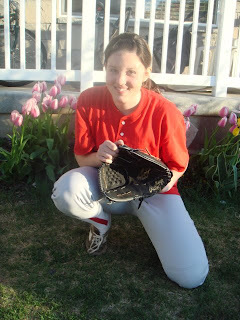 Her team, the Indians, didn't win the first game of the season but Cami, who was really nervous, still played great! 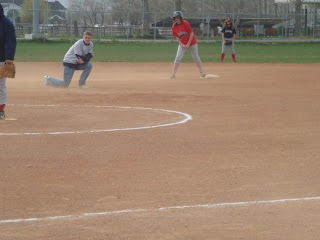 She got on base twice, ran home and scored once! In outfield she made a great stop of the ball. The game turned out to be fun and not as scary as she had thought. But it sure was cold!!! Thanks Josh. I am looking forward to next week's verse! I've decided to try and do a little birthday spotlight on the important people in my life. 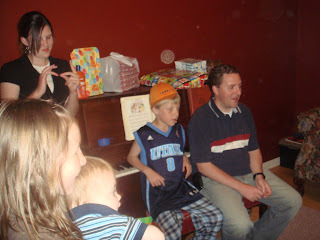 Dad just celebrated his birthday on Saturday, April 26!! He is a very hardworker. He is happiest when he has a big project. He is generous. When I needed money and asked him for a ten he gave me a twenty. He is so talented! He can make or restore practically anything: robots, old cars, tractors, guns, awesome pinewood derby cars, campers, sheds, garages and a beautiful family home. He is quite the teaser! I remember him trying to pay with his "small checks", checking out our new shoes by tipping us upside down, sneaking food off our plates, and sneaking me his buttermilk at a restaurant. That one kind of backfired on him. I appreciate all he has done for me. I now realize all that being a parent requires. It's not nearly as easy as I thought it was going to be! This little story is one I tell my children about Grandpa Kearl. I think my Grandma Kearl told it to me as a little girl. I always thought it was very funny. Thanks for the sacrifices you made on my behalf, Dad!! I love you. Did I mention Dad can be silly? Enoch gave us all a good laugh yesterday. 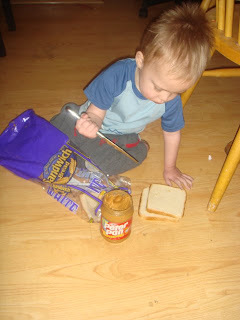 Rachel made herself a peanut butter and honey sandwhich. Enoch saw her and wanted one. I was busy doing something and told him I would make him one in a minute. Then I forgot all about it. 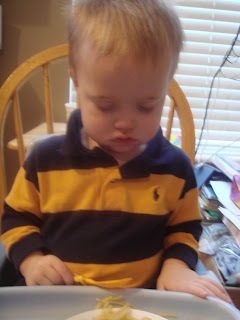 A few minutes later I came back into the kitchen and found him hard at work making his own sandwhich. 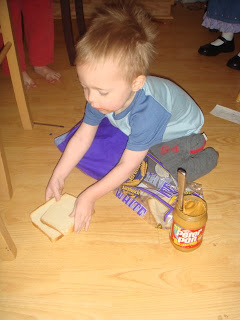 He had managed to pull the loaf of bread and peanut butter to the floor and was spreading two slices of bread with peanut butter. I got my camera and took pictures. It's a good thing I mopped the floor on Saturday night so it was sort of clean. 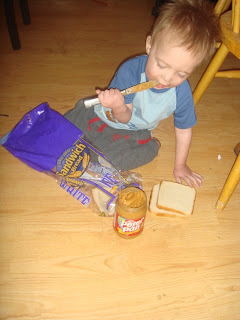 Spreading peanut butter is hard work. Ta Da! Enoch's first sandwhich! In all fairness to Ashley her prom dress wasn't as bad as I made it sound. 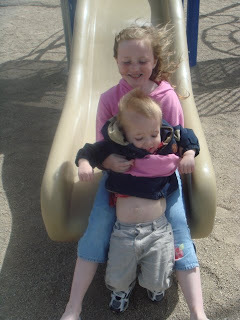 Vaughn and I happen to be super picky about modesty! Ashley decided yesterday to go to Prom tonight with a bunch of friends. They all went shopping last night for Prom dresses. I don't know what I was thinking letting her do this with friends. I guess I was a little relieved I didn't have to take her because I already had plans and frequently I let her social life change my plans and I didn't want to have that happen again. So I let her go.When I picked her up last night and saw the dress I wasn't too thrilled, but the receipt said in big bold letters NO RETURNS! Vaughn was less thrilled and put his foot down and said she couldn't wear it without some modifications. Needless to say that didn't go over too well. We had a very unhappy daughter last night and this morning. I spent the morning modifying the dress. 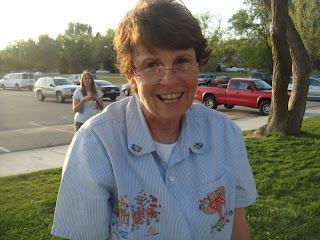 Fortunately my neighbor, Lisa Ivie, who is talented at sewing was able to tell me what to do. I actually think it looks great now! It even got Ashley's approval when I took it to her after school. What a relief! So the moral of the story is : Don't let your daughter go shopping without you for her prom dress. I am sorry I had to learn the hard way with Ashley but hopefully it will save me from future anquish with Cami, Noelle, Rachel, and Rebekah. Spring break passed a little too quickly for most of us but we sure loved it while it lasted! Ashley spent many hours during the break working on her quilt. She finished all but the binding. She even was available to take a few babysitting jobs (a rare thing- she usually has to much homework and a full social calendar) and earned some money. 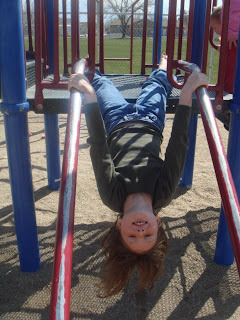 Ashley was the only one excited about returning to school, not necessarily to attend classes, just to see her friends. 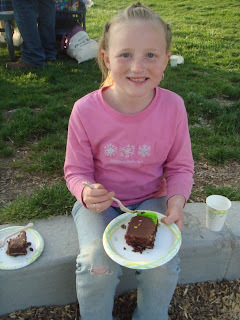 Cami spent a lot of time practicing softball, reading Harry Potter, and of course babysitting. Josh was fortunate enough to have a Scout trip to Goblin Valley. He did lots of hiking with his troop. 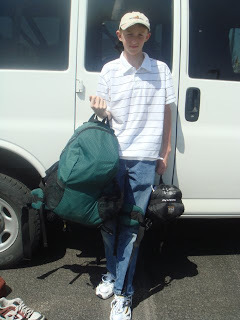 Josh is ready to go to Goblin Valley!! Noelle, Rachel, and Rebekah played to their hearts content with their friends without homework getting in the way. Enoch enjoyed having all of his fans so readily available. He did his best to get in on the fun. Jumping on the tramp is now one of his favorite activities. All of the spring break action wore Enoch out. He fell asleep at the dinner table. 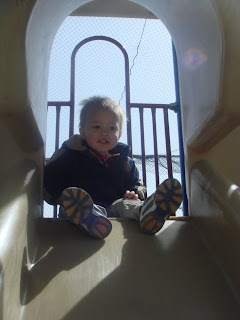 There is a playground at the ball park. So on Tuesday and Wednesday mornings while Cami was practicing softball, Noelle, Rachel, Rebekah, and Enoch braved the cold wind and had some fun. I Love living close to the Temple! 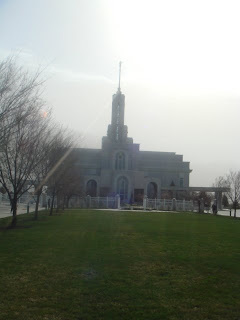 I got to go to the temple early yesterday morning.! I found the peace and some of the answers I was looking for. I had promised Cami and Josh a bike ride on Monday so in spite of the ache in my heart for my friend we filled up our water bottles, strapped on our helmets, and hit the road on our "bikables" (Enoch's name for bicycles). This is one of my favorite spots on the trail. It's even prettier when the plants are more green. I made Cami and Josh stop and pose. 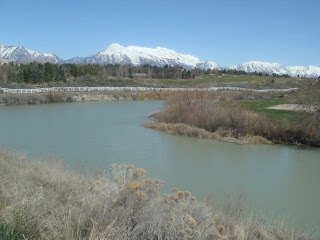 We had intended to ride to Utah Lake (9 miles) or at least to Willow Park (7 miles) but the wind was blowing and by the time we made it to the little park we went to on Saturday (4 miles) we were ready for a rest. Well, at least Cami and I were ready for a rest. Josh could have gone on and on. I now realize all of those stops we made on Saturday were actually helpful, yes I will admit it even to impatient me. The ride home was easier. The wind was helping us. Even still, Josh left us in the dust. I am feeling sad. I just found out yesterday that a dear friend, who has already endured a year of Job like trials recently lost her husband. He was killed in a car accident. Elder Costa quotes a text posted on an airline communication board by the husband of a flight attendant who was killed in a devastating aircraft accident in July 2007 in Brazil. The text epresses the urgency of not leaving for tomorrow what we can do today. It is based upon a poem by Norma Cornett Marek. If I knew this would be the last time I would watch you sleep,I would hug you tighter. I would plead with the Lord to protect you. If I knew this would be the last time I saw you walk out the door,I would hug and kiss you and call you back to hug and kiss you one more time. If I knew this would be the last time I would hear your voice in prayer,I would record every gesture, every look, every smile, every one of your words,So that I could listen to it later, day after day. If I knew this would be the last time, I would spend an extra minute or two to tell you, "I love you," instead of assuming you already knew it. "Well, I'm sure other opportunities will come, so I can let this day go by." And we would have a second chance to do things right. Oh, of course there will be another day for us to say, "I love you." And certainly there will be another chance to tell each other, "Can I help with anything?" But in my case, there isn't one! I don't have you here with me, and today is the last day we have—our farewell. And I hope you never forget it. Tomorrow is not promised to anyone, young or old. Today might be your last chance to hold tight to the hand of the one you love and show all you feel. If you are waiting for tomorrow, why not do it today? Because you were too busy to give that person what ended up being their last wish. Then hug tight today the one you love, your friends, your family, and whisper in their ears how much you love them and want them close to you. Because if tomorrow never comes, you will not have to regret today. The past doesn't come back, and the future might not come! My friend's experience has reminded me how precious and uncertain our time together in this life is. We need to make sure we use the time we have to show our love for each other and to do God's work. We should live so as not to have regrets. One of my favorite things to do is ride my bike on the trail behind our house. It's an escape! Except for when I take little people, then it becomes a lesson in patience. Today Josh, Noelle, a couple of neighbor boys, and I decided to hit the trail for the first time this year. The little people had a lot of fun and Josh and I worked on developing more patience. We rode 4 miles to a park strategically placed along the trail, took a play break and after some coaxing to leave the park we pedaled home. With lots of stops to look at a moth, pick up a golf balls (the trail passes through a golf course), throw rocks into the river, use the restroom, take a drink, wait for stragglers, get Noelle's pants out of her chain, rest, and walk up a hill it took longer than I had hoped and Vaughn expected. He ended up coming to look for us. He found us about a mile from home. Josh and I decided next time we'd do it alone. Ashley was honored today at school during a special assembly. 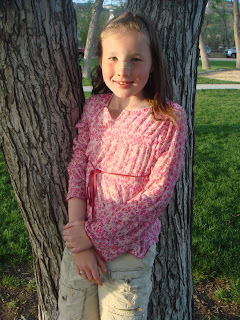 She is Maeser Prep Academy's top Latin student! Via praecessi Ashley! Nos es superbus vestrum! She attributes her success to the fact that she already knows what everyone is learning in class because she learned it as a homeschooler. 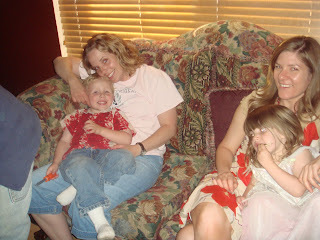 Her teachers were none other than my homeschooling friend Karon Knauss, and myself, her mother. We taught ourselves and our children beginning Latin around the kitchen table. I (Holly) am super tired because I stayed up too late reading a book about blogs. It was very interesting! Vaughn is home recuperating from a serious toothache. He had to have a root canal. Ashley is peeved with us (Vaughn and Holly) because we don't see eye to eye with her on which American Idol contestant should go home tonight. 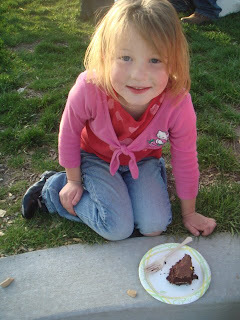 Cami is taking a math and writing placement test so she can get into Maeser Prep Academy next year. Josh is in for a surprise when he gets home from school because I am spring cleaning his room today. Noelle and Rachel are at school hopefully having a great day. Rebekah is on a field trip to Farm Country at Thanksgiving Point with her kindergarten class! She has been anxiously awaiting this event. Enoch is "helping" me spring clean but it is almost nap time. What will I do without his help? 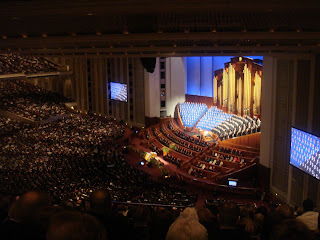 A couple of weeks ago, Josh requested that we attend General Conference. Our bishop was able to get us 5 tickets for the Sunday morning session. Vaughn and I were a little reluctant to give up the wonderful, stress-free Sunday morning that only comes twice a year in exchange for getting up extra early, finding a place to park, and joining the conference crowds, but we are glad we did! Even though we were about as far away as we could get from the pulpit on the far corner of the balcony, Vaughn, Cami, Josh, Noelle (who was so excited to be old enough! 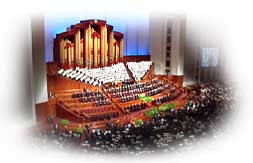 ), and I appreciated being there in the Conference Center hearing President Monson, the apostles, and other general authorities speak. It was a memorable experience. 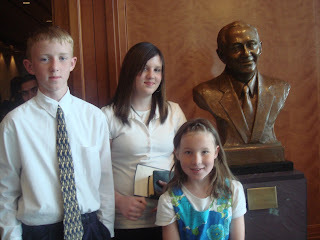 Here Josh, Cami, and Noelle are posing in the Hall of the Prophets next to the bust of President Gordon B. Hinckley. Being in the Conference Center, especially in this room, reminded us of President Hinckley's viewing. The Hall of the Prophets is where his casket was displayed. The temple grounds were crowded but beautiful with all of the lovely spring flowers. Cami tried out for softball yesterday. She's been practicing a lot but she was still really nervous. Vaughn and I think she did a great job. We are proud of her for trying out! On Saturday Ashley, Cami, and I got to go downtown to the Conference Center to see the General Young Women's Conference. On the way we treated ourselves to an early dinner at Panda Express. The General YW Presidency and President Eyring gave some great talks. The music and surroundings were beautiful. 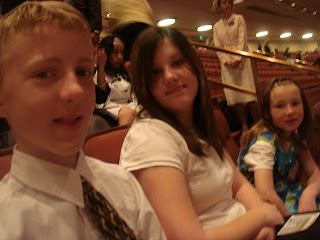 We were however a little bit disappointed that President Monson didn't speak. We got a chuckle after the meeting as President Eyring waved his cane at us as he exited. 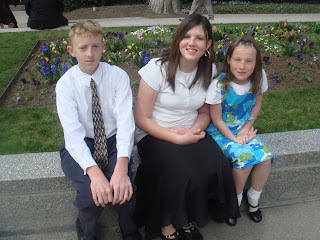 We took a few minutes after the meeting to see the Christus in the Visitors Center and I had planned on taking pictures of the girls on Temple Square with all of the flowers but I discovered that I forgot to put the battery back in the camera after I charged it. So we didn't get to take pictures. We still had an enjoyable afternoon and evening together. I am grateful I have such wonderful daughters.